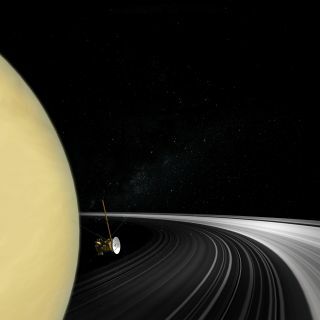 An artist's concept of the Cassini spacecraft shown against a real photo of Saturn and its rings as Cassini crossed the ring plane. Saturn has not always had rings — the planet's haloes may date only to the age of dinosaurs, or after it, a new study finds. The age of Saturn's rings has long proven controversial. Some researchers had thought the iconic features formed along with the planet about 4.5 billion years ago from the icy rubble left in orbit around it after the formation of the solar system. Others suggested the rings are very young, perhaps originating after Saturn's gravitational pull tore apart a comet or an icy moon. Iess and his colleagues relied on more Cassini data. Before the spacecraft plunged to its death into Saturn's atmosphere in September 2017, it coasted between the planet and its rings and let their gravitational pulls tug it around. The strength of a body's gravity depends on its mass, and by analyzing how much Cassini was pulled one way or the other during the "grand finale" phase of its mission, the mission team could measure the gravity and mass of both Saturn and its rings. During six of Cassini's crossings between Saturn and its rings at altitudes about 1,615 miles to 2,425 miles (2,600 to 3,900 kilometers) above the planet's clouds, scientists monitored the radio link between the spacecraft and Earth. Much as how an ambulance siren sounds higher pitched as the vehicle drives toward you and lower pitched as it moves away, the radio signals would lengthen in wavelength as their source moved away Earth and shorten as their source moved toward it — an effect called the Doppler shift. "I'm astonished by the fact that we were able to measure the velocity of a distant spacecraft 1.3 billion kilometers [807 million miles] away from Earth with an accuracy that is a hundredth or a thousandth the speed of a snail — a few hundreds of millimeters per second," Iess said. Saturn's interior is mainly composed of three layers: a deep inner core made mostly of heavy elements, with a liquid metallic hydrogen envelope, surrounded by a molecular hydrogen layer. Cassini measurements are telling scientists about the size of the core, the flow of winds in the atmosphere and the mass of the rings. Cassini's grand finale also revealed key details about the internal structure of Saturn. For example, it found that jet streams seen around Saturn's equator — the strongest measured in the solar system, with winds of up to 930 mph (1,500 km/h) — extend to a depth of at least 5,600 miles (9,000 km), rotating a colossal amount of mass around the planet about 4 percent faster than the layer below it. "The discovery of deeply rotating layers is a surprising revelation about the internal structure of the planet," Cassini project scientist Linda Spilker at NASA's Jet Propulsion Laboratory in Pasadena, California, who did not participate in the study, said in a statement. "The question is, What causes the more rapidly rotating part of the atmosphere to go so deep, and what does that tell us about Saturn's interior?" The new findings also suggest that Saturn's rocky core is about 15 to 18 times the mass of Earth, similar to prior estimates.